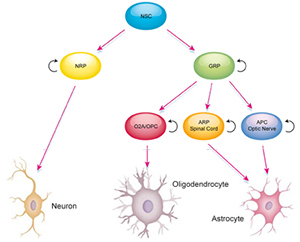 Neural stem cells (NSCs) are present in both developing mammalian and adult nervous systems. They are multipotent and have the potential to differentiate into the cells that comprise the nervous system including oligodendrocytes, astrocytes, neurons and glia. The two areas of the adult brain that display neural proliferation are the dentate gyrus and the subventricular zone. However, NSCs have also been shown to contribute to hematopoiesis following their injection into irradiated mice. 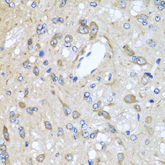 Immunohistochemistry of paraffin-embedded rat brain using Rabbit Anti-CD184/CXCR4 Antibody at a dilution of 1/100 (AHP2451). Popular markers for NSCs include: BMI-1, CXCR4, Nestin, SOX2, Vimentin. Bio-Rad offers a broad collection of neural stem cell antibodies. Click on the related links below to explore our product range by marker or use the filters in the table below to sort the attributes in order to find the antibody that fits your exact requirements. Franco S J et al. (2012). Fate-Restricted Neural Progenitors in the Mammalian Cerebral Cortex. Science 337, 746-749. Gage FH (2000). Mammalian Neural Stem Cells. Science 5457, 1433-1438. Gage F H and Temple S (2013). Neural Stem Cells: Generating and Regenerating the Brain. Neuron 80, 588-601. Morrison S J et al. (1999). Prospective identification, isolation by flow cytometry, and in vivo self-renewal of multipotent mammalian neural crest stem cells. Cell 96, 737-749. Nosia P et al. (2012) Identification and Characterisation of the Early Differentiating Cells in Neural Differentiation of Human Embryonic Stem Cells. PLoS One 7, e37129. Scott C E et al. (2010) SOX9 induces and maintains neural stem cells. Nature Neuroscience 13, 1181-1189. Vinci L et al. (2016) Immunohistochemical Markers of Neural Progenitor Cells in the Early Embryonic Human Cerebral Cortex. Eur J Histochem 60, 2563. Yuan S H et al. (2011). Cell-Surface Marker Signatures for the Isolation of Neural Stem Cells, Glia and Neurons Derived from Human Pluripotent Stem Cells. PLoS One 6, e17540.